"They go in and snuggle up. Of course, they might tear it to shreds after a while," she said. But she knows they like the fur — if they didn't "they would just throw it out. They wouldn't keep in it their nesting box." Coats for Cubs program helps orphaned, injured or sick wild animals by gathering fur coats and using them for nests or bedding or cuddly. Got a fur coat gathering dust? The Humane Society suggests the ultimate recycling — putting it on the backs of other animals. The Coats for Cubs program by the Humane Society of the United States helps orphaned, injured or sick wildlife by gathering fur coats and using them for nests, bedding or cuddly replacements for mom and dad. In 2009, 2,687 fur items were donated. 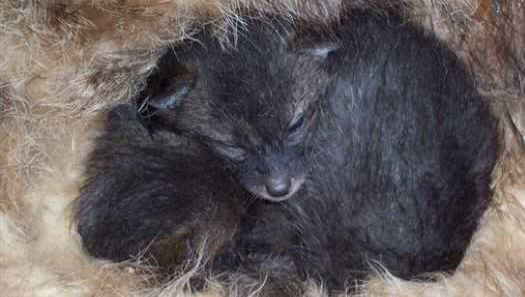 A 2-week-old grey fox sleeps in donated fur. "We use the discarded furs as bedding to give the animals comfort and reduce stress," said Michael Markarian, the agency's chief operating officer in Washington, D.C. "The fur garments act as a surrogate mother. It is a warm and furry substitute." The coats go to wildlife rehabilitation centers that take in baby raccoons, chipmunks, squirrels, coyotes, skunks and other animals, and has helped thousands of animals since it began in 2005 with the Fund for Animals. Markarian said many of the coats are donated by people who find fur to be inhumane — whether the animals are trapped in steel-jawed traps or raised on factory farms. For those who have fur and no longer want to wear it, "This is a great way for them to give back to the animals," he said. Amber Ginter, 13, from Kingston, Ohio, spent last summer collecting fur coats as part of a community project affiliated with the Humane Society. She put a box in her church, wrote a letter describing the project in the church bulletin and collected 30 coats in two months, she said. "It was kind of sad to see all the furs because you know they had to kill the animals to get them," said Amber, who wants to be a veterinarian or zoologist when she grows up. The Florida Wildlife Center in Fort Lauderdale, Fla. has used coats for wildlife babies in the past, but employees and volunteers had to scrounge for donations, twist arms, or scour garage sales and thrift stores. After becoming a Humane Society affiliate last June, the center got three boxes full of furs and are well stocked for baby season. "It's a remarkable, generous way to make good of a tragic beginning. I know young people are involved in this effort. Bravo for understanding this better than adults and for seeing a positive way to help other animals," said Sherry Schlueter, managing director at the Florida Wildlife Center in Fort Lauderdale, Fla. The center houses what they believe is the largest wildlife trauma center in the United States, Schlueter said. Of the 12,000 animals cared for in 2009, just over 1,900 were orphaned babies, including about 1,000 gray squirrels, Virginia opossums and raccoons — those most likely to benefit from the furs. The center is expecting at least 1,000 additional baby animals in 2010 because a nearby wildlife rehab center closed last year. The coats are always needed, but they are especially welcome in one of the worst winters in memory, said Erica Yery, president of the Wild Bunch Wildlife Rehabilitation Center in Alexandria, Va. Most of the baby animals she has now are raccoons who are making good use of the coats. The coats are great, but caps and hats are even better, she said, because she doesn't have to cut them and they are already rounded like nests. The current Coats for Cubs coat drive technically ends on Earth Day, April 22, but the Humane Society will accept coats any time of the year, Markarian said. Donations can be shipped to the group or turned in to any Buffalo Exchange, which has stores or franchises in 14 states.